The registry is the place where windows stores all the settings related to hardware that it controls, software installed and other windows environment settings; like toolbar, colors, menus, etc. So to apply our own customized settings, registry editing is must. 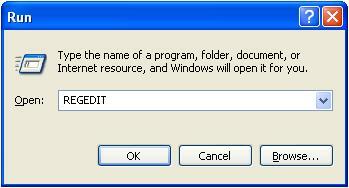 To open the registry go to 'start menu' > run then type regedit and press Enter. 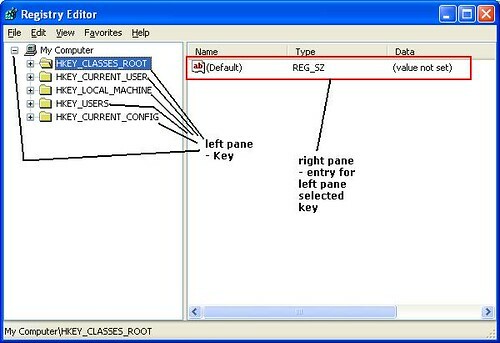 Then registry editor opens, where the left pane has folder tree like hierarchy. Each item here is called Key and they may again have further sub-keys. When you select a key you will find some items in right pane. These are entries corresponding to selected keys. It is the entries that store the settings. Entries can store three types of data: String, Binary and DWORD. To create a new key just right click the parent key and select New > Key. to create an entry select the key in left pane, right-click over in right pane and select the data type of the entry to be created. The changes to registry may not be effective right then and there; sometimes it may need Restart or log-off or simply pressing function key F5 (refresh) will apply the customizations. For particular software changes, sometimes only restarting the application will work.